Since the foundation of Myday Machinery Inc., we have been committed to creating and providing the most cost effective (maximum functionality at the minimum cost) products and services to the whole world. We are a professional manufacture in Heavy Duty Lathes & CNC Lathes. We have a strong R&D department which can accept customer's special requirement. We emphasize pursuit of excellence and customer satisfaction more than growth in revenue and profit. Your criticism and suggestion will be more helpful to us for achieving our objectives. 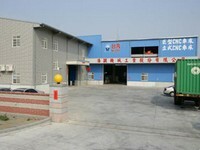 And we also are strict to our quality of product standard in order to make customer have good right. Besides, we also provide excellent service to our customer. We guarantee we must make you satisfy with our product and service. Therefore, if you have any question about our product, you can tell us. We will give you early reply. Furthermore, we look forward to searching a good business partner. If you are interested, please feel free to contact with us or you can email to us. Please do not hesitate to let us know how we can you better. Manufacturer of large spindle lathes, CNC flat bed lathes, CNC turning machines, CNC lathes, CNC oil country lathes, heavy duty precision lathes, large spindle bore lathes, CNC turning and grinding machines, and turning centers.